Want to get your peer references back within 3 days – instead of 4 to 5 weeks? When you automate the key processes involved in credentialing, you get results faster… speed up onboarding of new physicians…and make better decisions in hiring qualified doctors. Explore the benefits of a cloud-based paperless credentialing process and learn the key questions to ask providers about their systems when sourcing. 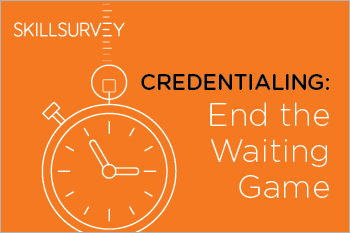 Download our new whitepaper: Credentialing – End the Waiting Game, Adopt New, Mobile Technology.